I begin writing this review having spent one tedious hour working on the opening illustration to my sermon last Sunday (while juggling whether I really nailed the big idea and big question). I’ve been at the work of preaching for just over a year, and I’m privileged and very thankful to be working with friend and mentor Ben Ho. I should also start this review where my friend Nathan Campbell started: a disclaimer. Gary Millar is a friend and principal of the college I attended, Queensland Theological College. Phil Campbell is also another friend who taught me preaching while at QTC. So I can’t say that my review will be completely impartial, but I don’t think it matters that much. 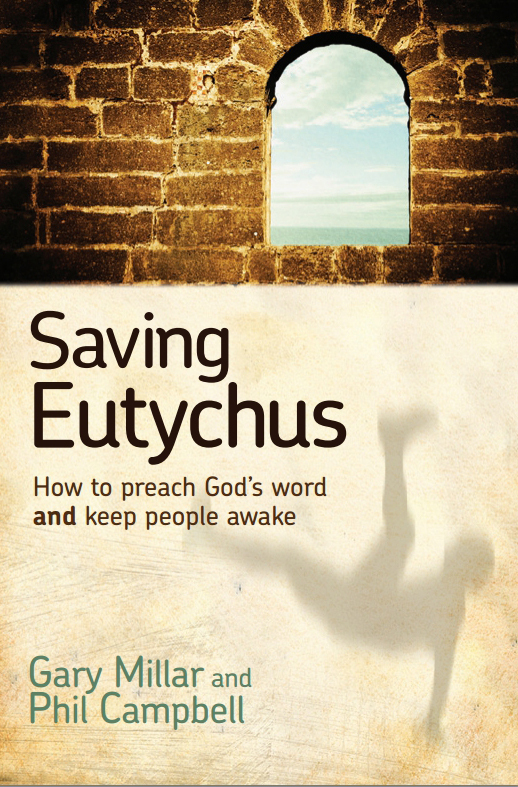 Saving Eutychus gets its nifty title (partly inspired by Nathan’s blog) from the little incident in Acts 20. It’s Paul’s final evening with in Troas and he’s probably pretty keen to impart as much teaching as possible – even going way into the evening. By around midnight Eutychus, who was listening in, struggles to stay awake and ends up falling asleep. On a window sill. Three stories up. As Phil jokes, with a little apostolic first aid, the young man’s ‘terminal velocity’ wasn’t as terminal as it could have been. I’ve seen the droopy heads. I’ve seen the glazed eyes. Every so often I can grab everyone’s attention with an illustration only to lose it again as soon as I begin talking about the text for the morning. Deflated, yes. But the rest of the book serves up some real encouragements and challenges. Real change in the lives of believers isn’t just for their benefit, but also taps into God’s purposes to make known his glory to this world. Gary’s chapter on preaching the gospel from the Old Testament is also very helpful. Prior to the start of my ministry apprenticeship I grew up on a diet of very poorly taught Old Testament sermons. There is enough in this chapter to whet the appetite, and enough references to do further reading. And that’s one of the great strengths of this book overall. It’s both encouraging and challenging. It sympathises with the weakness of the preacher who is reading, while at the same time pointing them forward, with hope (! ), to a better future. Phil’s top ten tips in chapter 3 bring back a lot of memories. There’s plenty there, as well as some helpful website links to gauge sentence length. It’s a very Phil chapter. But probably the most heart-warming, or at least to me, chapters was Gary’s on ‘Faithful Wounds: the importance of critique’. Gary steps through the importance of faithful constructive criticism to grow our preaching. In this regard my partner in ministry, Ben Ho, has been a faithful friend. Particularly as a young Gen-Yer, who finds it difficult to separate my performance from my personhood (as is a general flaw of Gen-Y and Millenials), Ben has faithfully walked me through each of my sermons, shown the strengths and the weaknesses and has encouraged me along. The wounds of a friend are faithful indeed. This book is not just for the young preacher, though this young preacher benefited from it greatly. It’s not even just for the old preacher. But anyone who wants a glimpse at the process of crafting a sermon. I know some preachers who would benefit from this book greatly. I also know plenty of sermon listeners who could do with reading this book, if only to be better listeners. This is a great book. The message to preach clearly with simplicity for maximum gospel punch is given clearly and with simplicity. What’s more is that each chapter is fairly personal. Gary’s chapters are very Gary. Phil’s chapters are very Phil. I felt like I wasn’t reading a how-to book on preaching, but was sitting in a bar, chewing the fat and listening to two of my favourite preachers chat about their craft. Saving Eutychus will be available from Matthias Media towards the end of March/early April.